Our new apps, available on iOS and Android, are here and ready for your enjoyment. We've made a load of small tweaks and cosmetic improvements but in this article we wanted to highlight the eight best new features to look out for. Please update your app now to take advantage of them. Not every customer, and not every Bonjoro use-case, is the same. That’s why you can now create multiple designs and call-to-actions to use when sending Bonjoros. Head to the design tab in the web app to create your designs, then select the right one (by swiping up) when reviewing your video in the mobile app. A lot of people have asked for this over the last year and we’re delighted to finally bring it to life. Please note that this feature is part of our newly launched $45 Sleuth plan. If you’re a power user of Bonjoro, or work in a team where each sender needs a different design or CTA, this one is for you! Bonjoro is still all about 1-1 videos, connecting with each and every customer in the most human way possible to create love and advocacy. That won't change, ever. But we also know that every now and then you need to send messages quickly to a group of customers or team members who have something in common. Enter multi-greets. Quickly send one video message to 5 recipients at the same time. Just swipe left on the app to Create New, and then enter up to 5 emails hitting done after each one. When your recipients are ready just hit the + button to add them to your ToDo list and start recording. Multi-greets, we think you’ll love them. Sometimes people get busy and your video messages slip down their inbox. Don’t worry though, we’ve made it even easier than ever to resend your Bonjoro. Head to the Results tab on your app by swiping right. From here you can see every Bonjoro you have sent, including whether they have been opened, viewed, clicked or thanked. To resend a Bonjoro just select the unopened recipient’s name, and click “resend”. You can even review the video you sent right from within the app by clicking play. Cool huh? Any Bonjoros you send are now accessible to watch back right from within the app. Just swipe left to view your Results, click on each recipient, and hit play to see the video you sent. Easy peasy. Let’s not forget that with video apps the unheralded champion of usability it speed and reliability uploads. So please thank our devs for taking this to a new level for the latest apps. Not only have they increased upload speeds, but they’ve improved our compression so the video files you upload use up even less of your treasured data. Two in one. To launch the features above we remodelled the Results view. This makes it even easier to see when you sent each Bonjoro, and whether it has been opened, viewed, clicked, or thanked. Hope you like it! The best Bonjoros are often those recorded on the move. You don’t need to be at your desk to connect with customers - you can just as easily invite them into your world on the commute to work, or even on the way to grab lunch or a coffee. 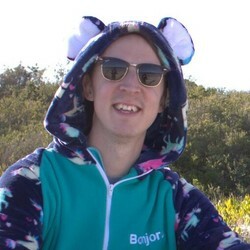 Now you can record your Bonjoros without an active internet connection and they will upload when you hit wifi or 4G so any location in the world is available to you as a potential Bonjoro backdrop. The outback, a mountain, 20,000 leagues under the sea. You name it, you can now record a Bonjoro there. That’s it for now, but that’s very much not it for this year. We have another huge update coming in 2018 that we can't wait to share with you. Guess we’d best get back to work. Got any feedback on our new app? Drop us an email at earth@bonjoro.com or find us on our Twitter, @bonjoroapp.